The New England town (generally referred to simply as a town in New England) is the basic unit of local government and local division of state authority in each of the six New England states. Without a direct counterpart in most other U.S. states, New England towns overlay the entire area of a state, similar to civil townships in other states where they exist, but are fully functioning municipal corporations, possessing powers similar to cities in other states; New Jersey's system of equally powerful townships, boroughs, towns and cities is the most similar system to New England's. New England towns are often governed by a town meeting legislative body. The great majority of municipal corporations in New England are based on the town model; statutory forms based on the concept of a compact populated place, which is prevalent elsewhere in the U.S., are uncommon. County government in New England states is typically weak at best, sometimes even nonexistent. Connecticut, for example, has no county governments, nor does Rhode Island. Both of those states retain counties only as geographic subdivisions with no governmental authority, while Massachusetts has abolished eight of fourteen county governments so far. With few exceptions, counties serve mostly as dividing lines for the states' judicial systems. Towns are laid out so that nearly all land within the boundaries of a state is allocated to a town or other corporate municipality. Except in some very sparsely populated areas of the three northern New England states (primarily in the north), all land is incorporated into the bounds of a municipal corporation's territory, even in rural areas. A town almost always contains a built-up populated place (the "town center") with the same name as the town. Additional built-up places with different names are often found within towns, along with a mixture of additional urban and rural territory. There is no territory that is not part of a town between each town; leaving one town means entering another town or other municipality. 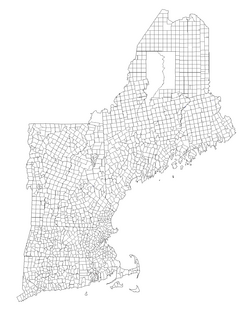 In most parts of New England, towns are irregular in shape and size and are not laid out on a grid (the leading exception is Vermont, and much of the interior of Maine was originally laid out as surveyed townships). The town center often contains a town common, often used today as a small park. Since virtually all residents live within the boundaries of a municipal corporation, residents receive most local services at the municipal level, and county government tends to provide few or no services. Differences among states do exist in the level of services provided at the municipal and county level, but generally most functions normally handled by county-level government in the rest of the United States are handled by town-level government in New England. In Connecticut, Rhode Island and most of Massachusetts, county government has been completely abolished, and counties serve merely as dividing lines for the judicial system. In other areas, some counties provide judicial and other limited administrative services. In many cases, the house numbers on rural roads in New England reset to zero upon crossing a town line. More than 90% of the municipalities in the six New England states are towns. Other forms of municipalities that exist—most notably, cities—are generally based on the town concept as well. Most New England cities are towns that have grown too large for a town meeting to be an effective legislative body, leading the residents to adopt a city form with a mayor and council. Municipal entities based on the concept of a compact populated place, such as a Vermont village or Connecticut borough, are uncommon. In areas of New England where such forms do exist, they remain part of the parent town and do not have all of the corporate powers and authority of an independent municipality. 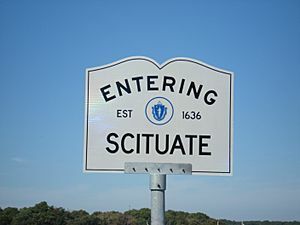 Massachusetts town line sign, indicating the name of the town, the date of its establishment, and the seal of the state. Towns date back to the time of the earliest English colonial settlement, which predominated in New England, and they pre-date the development of counties in the region. Throughout the 17th, 18th and 19th centuries, as areas were settled, they were organized as towns. Town boundaries were not usually laid out on any kind of regular grid, but were drawn to reflect local settlement and transportation patterns, often affected by natural features. In early colonial times, recognition of towns was very informal, sometimes connected to local church divisions. By 1700, colonial governments had become more involved in the official establishment of new towns. Towns were typically governed by a town meeting form of government, as many still are today. Towns originally were the only form of incorporated municipality in New England. The city form of government was not introduced until much later. Boston, for instance, widely regarded as the unofficial capital of New England, was a town for the first two centuries of its existence. The entire land areas of Connecticut and Rhode Island had been divided into towns by the late 18th century, and Massachusetts was almost completely covered early in the 19th century. By 1850, the only New England state that still had large unincorporated areas left was Maine; by the end of the 19th century, most areas in Maine that could realistically be settled had been organized into towns. Early town organization in Vermont and much of New Hampshire proceeded in a somewhat different manner from that of the other New England states. In these areas, towns were often "chartered" long before any settlers moved into a particular area. This was very common in the mid to late 18th century (towns in southeastern New Hampshire such as Exeter, which predated that period, were not part of this process, however). Once there were enough residents in a town to formally organize a town government, no further action was necessary to incorporate. This practice can lead to inconsistencies in the dates of incorporation for towns in this region. Dates given in reference sources sometime reflect the date the town was chartered—which may have been long before it was settled—not the date its town government became active. In other parts of New England, it was not unheard of for "future towns" to be laid out along these lines, but such areas would not be formally incorporated as towns until they were sufficiently settled to organize a town government. Although towns are the basic building block of the New England municipality system, several other types of municipalities also exist. Every New England state has cities. In addition, Maine also has a unique type of entity called a plantation. Beneath the town level, Connecticut has incorporated boroughs, and Vermont has incorporated villages. In addition to towns, every New England state has incorporated cities. However, cities are treated in the same manner as towns under state law, differing from towns only in their form of government. Most cities are former towns that changed to a city form of government because they grew too large to be administered by a town meeting. However, even that distinction has become somewhat blurred in recent years. Cities are typically governed by a mayor (and/or city manager) and city council or other similar arrangement. In common speech, people often generically refer to communities of either type as "towns", drawing no distinction between the two. The presence of incorporated boroughs in Connecticut and incorporated villages in Vermont has influenced the evolution of cities in those states. In Connecticut in particular, the historical development of cities was quite different from in the other New England states, and at least technically, the relationship between towns and cities is even today different from elsewhere in New England. Just as boroughs in Connecticut overlay towns, so do cities; for example, while Hartford is commonly thought of as a city, it is coextensive and consolidated with the Town of Hartford; governed by a single governmental entity with the powers and responsibilities of the Town being carried out by the entity referred to as the City of Hartford. In legal theory though not in current practice Connecticut cities and boroughs could be coextensive (covering the same geography as the town) without being consolidated (a single government); also a borough or city can span more than one town. In practice, though, most cities in Connecticut today do not function any differently from their counterparts elsewhere in New England. See the section below on boroughs and villages for more background on this topic. Population is not a determination in what makes a city or a town in New England and there are many examples of towns that have larger populations than nearby cities. The practical threshold to become a city seems to be higher in the three southern New England states than in the three northern New England states. In Massachusetts, Connecticut and Rhode Island, almost every city has at least 10,000 people, and there are only a few that have fewer than 20,000. In Maine, New Hampshire and Vermont, there are a number of cities with fewer than 10,000 people, even a couple with fewer than 5,000. Over time, some of the distinctions between a town and a city have become blurred. Since the early 20th century, towns have been allowed to modify the town meeting form of government in various ways (e.g., representative town meeting, adding a town manager). In recent decades, some towns have adopted what effectively amount to city forms of government, although they still refer to themselves as towns. As a practical matter, one municipality that calls itself a town and another that calls itself a city may have exactly the same governmental structure. With these changes in town government, a reluctance to adopt the title of city seems to have developed, and few towns have officially done so since the early 20th century. In Massachusetts, 13 municipalities (Agawam, Amesbury, Barnstable, Braintree, Easthampton, Franklin, Greenfield, Palmer, Randolph, Southbridge, Watertown, West Springfield and Weymouth) have adopted Mayor-Council or Council-Manager forms of government in their home rule charters, but nevertheless continue to call themselves "towns", although they are legally considered to be cities by the Secretary of the Commonwealth's office and are sometimes referred to in legislation and other legal documents as "the city known as the Town of ...". To an extent, whether or not a community is labeled a city is related more to how large it was relative to the general population a century ago than to how large its population is today. In colonial times, Massachusetts also used the term "plantation" for a community in a pre-town stage of development (Maine originally got the term from Massachusetts, as Maine was part of Massachusetts until 1820, when it became a state via the Missouri Compromise). The term plantation had not been much used in Massachusetts since the 18th century. Massachusetts also once had "districts," which served much the same purpose. They were considered to be incorporated, but lacked the full privileges of a town. Maine and Rhode Island are also known to have made limited use of the district concept. Districts have not been at all common since the first half of the 19th century, and there have not been any districts anywhere in New England in over a century. Maine is the only New England state that currently has a significant amount of territory that is not sufficiently populated to support town governments, thus the only New England state that still has a need for the plantation type of municipality. The term "village" is sometimes used in New England to describe a distinct, built-up place within a town or city. This may be a town center, which bears the same name as the town or city (almost every town has such a place), or a name related to that of the town, or a completely unrelated name. The town of Barnstable, Massachusetts, for example, includes "villages" called Barnstable, West Barnstable, and Hyannis. Except for the incorporated villages in Vermont, these "villages" are not incorporated municipalities and should not be understood as such. Towns do sometimes grant a certain measure of recognition to such areas, using highway signs that identify them as "villages", for example. These informal "villages" also sometimes correspond to underlying special-purpose districts such as fire or water districts, which are separately incorporated quasi-municipal entities that provide specific services within a part of a town. (In Maine and New Hampshire, the term "village corporation" is used for a type of special-purpose district.) Many villages also are recognized as places by the United States Postal Service (some villages have their own post offices, with their names used in mailing addresses) or the United States Census Bureau (which recognizes some villages as census-designated places and tabulates census data for them). 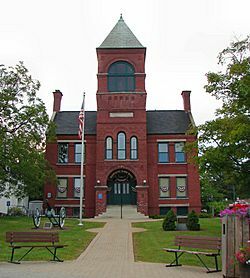 Towns with an example of the former, such as Richmond, Rhode Island, do not have a post office themselves, but instead use villages in town or villages in nearby towns as a mailing address. This leads to a weaker town identification in such towns, with residents more strongly identifying with the village they live in. However, villages or CDPs have no existence as general-purpose municipalities separate from the town (if they even have any legal existence at all), and are usually regarded by local residents as a part of the town in which they are located, less important than the whole. The majority of the unincorporated areas in New Hampshire are in Coos County, and the majority of the unincorporated areas in Vermont are in Essex County. Two additional counties in New Hampshire and three additional counties in Vermont contain smaller amounts of unincorporated territory. In Maine, eight of the state’s sixteen counties contain significant amounts of unorganized territory (in essence, those counties in the northern and interior parts of the state). Four other counties contain smaller amounts. All three of the northern New England states also include at least one unorganized township that was once a town, but has disincorporated and reverted to unorganized territory, in general, due to population loss. Maine also has some unorganized townships that were once organized as plantations. New Hampshire: The town of Livermore, located in a mountainous area of Grafton County, disincorporated in 1951. Livermore reported no population in its final census as an incorporated town (1950), and has reported no more than three residents in any census since then. Most of its territory is now part of White Mountain National Forest. Since it was once incorporated as a town, Wentworth’s Location could also be put into this category as well. Wentworth’s Location disincorporated in 1966; its population in the 1970 Census was 37. Maine has significantly more unorganized territory than Vermont or New Hampshire. Fewer than 100 Vermont residents and fewer than 250 New Hampshire residents live in unorganized areas. In Maine, by contrast, about 10,000 residents live in unorganized areas. As a result, Maine has developed more of an infrastructure for administration of unincorporated and unorganized areas than the other New England states. The existence of this fallback probably explains why Maine has had significantly more towns disincorporated over the years than any other New England state. There have been numerous instances of towns in Maine disincorporating despite populations that numbered in the hundreds. While these were not large communities, they were large enough to realistically operate a town government if they wanted to, but simply elected not to. In Vermont and New Hampshire, disincorporation has, in general, not been brought up for discussion unless a town’s population has approached single digits. That New England towns serve, in essence, the same function as incorporated places in other states, but are not treated as incorporated places by the Census Bureau, can be a source of confusion. The Census classifications should not be understood to imply that New England towns are not incorporated, or necessarily serve a similar purpose to MCDs in other states in terms of governmental function or civic-identity importance. New England towns are classified as MCDs not because they are not "incorporated" but because, in Census terms, they are not "places". New England metropolitan areas are grouped by towns, while in other regions they are grouped by counties. New England town Facts for Kids. Kiddle Encyclopedia.